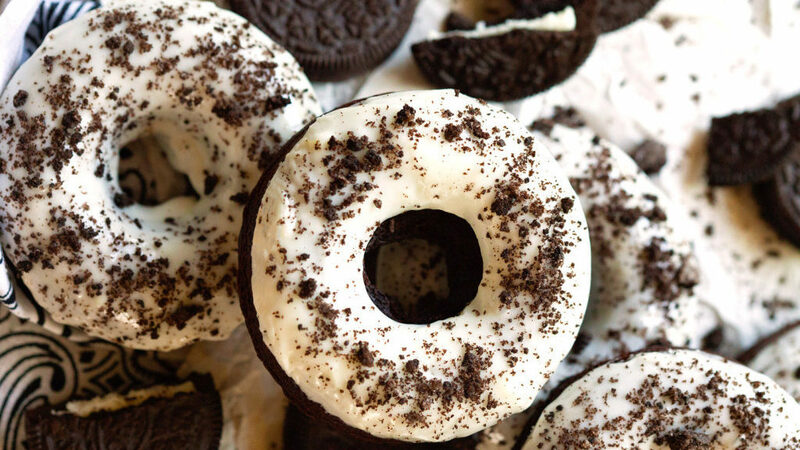 This is for all the doughnut lovers out there, especially if you’re an Oreo fan. Super moist and extremely chocolatey, we are dedicating this delightful recipe to you and your loved ones this weekend. So, give it a try and let us know what you think! Spray a doughnut pan with nonstick spray. Set aside. In a large bowl, whisk together egg, milk, oil, vinegar and vanilla until well combined. Then, add baking soda, baking powder and salt, and mix until incorporated. Whisk in brown sugar and then cocoa powder and flour until it forms a smooth batter. Then fold in the crushed Oreos. Transfer batter to a small Ziploc bag. Seal, cut off one corner and pipe the batter into the doughnut moulds. Place doughnut pan into the oven and bake for 10 minutes or until a toothpick inserted in the middle comes out clean. Remove doughnuts from the pan and place on a wire rack to cool. Prepare the glaze. In a medium bowl, whisk together milk and confectioner’s sugar. Add vanilla and whisk until smooth. In a small heatproof bowl, melt white chocolate chips in the microwave in 15-second increments until completely melted. Add melted white chocolate to the glaze and whisk together. Dunk doughnuts into the glaze, sprinkle with crushed Oreos and let sit until set (or place doughnuts into the fridge for a couple of minutes to speed up the process). Enjoy!